Hawaii Kai residents gave their opinions yesterday on the new proposed trash pickup recycling program that Mayor Mufi Hannemann will start there. 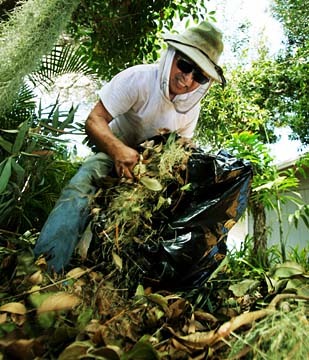 Ray Nakamura stuffed his "green" waste from his yard and garden into a plastic trash bag. In Ivy Kim's two-story Hawaii Kai home live nine people who create enough trash to overload their bin practically every time the garbage truck comes. Since Kim's family already recycles, she wonders how they will get by when the city removes Hawaii Kai residents' option to have biweekly trash pickups under its newly proposed curbside recycling pilot project. That is set for January. "Once-a-week trash pickup is not enough," Kim, 80, said yesterday. In Mililani, residents are given the option of paying $10 per month for a second trash pickup in addition to a weekly recyclable collection. "If the city gave us that option, I would definitely take it," she said. "It's going to be really rough for us." Most Hawaii Kai residents interviewed said they are excited to have curbside recycling come to their neighborhood beginning on Oct. 29 in the hope it will help divert some waste from Oahu's landfills. But others said it would not make a difference since they already recycle, and some expressed concern about having their trash sit out for a full week. "I've learned not to throw things like potato skins or carrot shavings down the garbage disposal," said Andrea Matsuda, of Hawaii Kai. "A week in the garbage, those things are going to rot and stink." Paul Muller said he would probably still take his newspaper and cardboard to benefit Kaiser High School's recycling program. "I'd rather see Kaiser High School make some money than set it out on my curb," said Muller, who redeemed $19 yesterday from three weeks' worth of beer bottles. But Muriel Aiwohi welcomes the change and said she will probably recycle more once the project starts. "It could work out with once-a-week trash pickup," she said. "It's all about getting used to the new schedule and seeing how much trash we still make." Suzanne Jones, the city's recycling coordinator, said households can request extra bins for free if they show there is a need. A curbside recycling pilot program will start Oct. 29 in Mililani and Hawaii Kai. 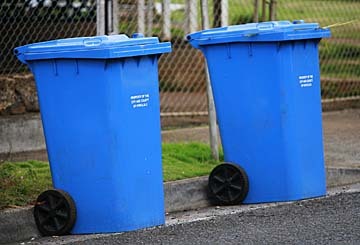 Pictured are blue recycling bins along Waikama Drive in Mililani yesterday. The first month and a half of the city's curbside recycling pilot program will be a sorting-out period for Mililani residents. That is how much time they will have to decide whether they will pay $10 per month to continue twice-per-week regular trash pickups in January. When the pilot program for Mililani and Hawaii Kai begins Oct. 29, residents in the two communities will get a third pickup per week for green waste one week and recyclables the next. But on Jan. 7 the city will eliminate one of the regular trash pickup days. Mililani residents who want to continue to have two regular trash pickups per week will have to go to a satellite city hall by mid-December to pay for the service for January, February and March. The $30 payment 15 days before each quarter is one of the provisions of a proposal moving along in the Honolulu City Council. "We'll try to get by without it, because we don't need any extra bills or expenses," said Mililani resident Sue Nowak. But if she and her family choose not to pay for the second trash pickup and realize later that one pickup is not enough, Nowak believes they will be forced to take the extra trash to a city refuse station. Resident Art Sambrano says he prefers to have his trash picked up twice per week but will try to get by with just one pickup. "We'll see how it goes," he said. Sambrano said even though he redeems his beverage containers, his trash bin is full on trash day. Residents Beatrice and Clement -- they declined to give their last name -- do not believe separating recyclables from their trash will make much difference because they, too, recycle their beverage containers and read the newspaper online. But because they produce a lot of green waste that they now throw in with their trash, they believe they might be able to get by with just one trash pickup per week.